This technical note will explain how you can work with handwritten files in conjunction with other features in Lexbe eDiscovery Platform. There is no 'perfect' OCR software in the market for handwriting recognition. 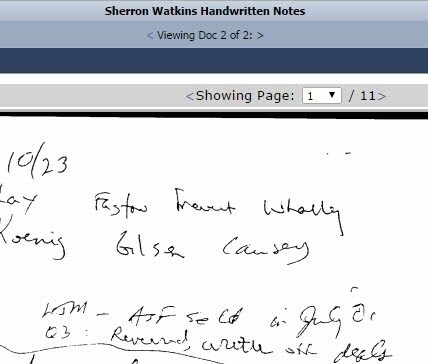 Lexbe OCR, and other OCR software, attempt to generate searchable text from handwriting files, but as OCR does best with printed fonts where the words were typed, getting text from handwriting is usually not very accurate. It works best with carefully printed handwriting as opposed to cursive handwriting. Even slightly messy handwriting is enough to confuse OCR Software! As you can see both files were available under the PDF tab, but due to a wide range of styles of writing and even issues with faded or ink-spotted areas the samples did not allow a searchable text to be generated. The 'Doc Type' built-in field (text-box) is part of the metadata section displayed under the Discovery Tab in the Document Viewer page. You can code the handwritten files using that field, and then save as part of the coding process. The Search page will also help you identify those type of documents for further review. If you run a search based on the text entered under the Doc Type fields, it will narrow down your search results showing only a subset of relevant results.